This is part two; you can find part one here. 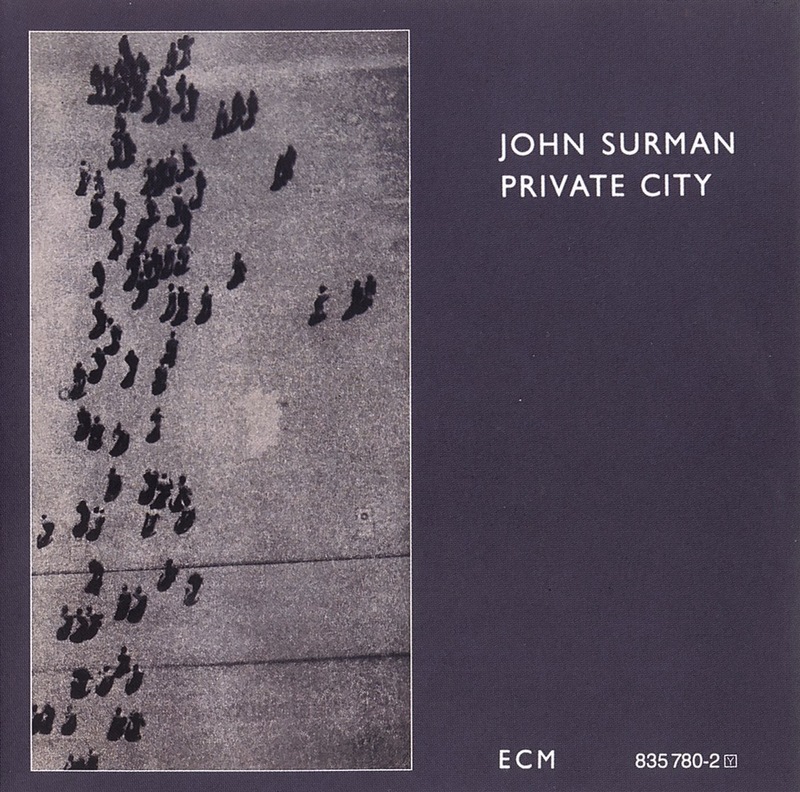 Upon Reflection established the pattern of Surman's subsequent solo albums: a mixture of 'pure' solo pieces, solo pieces with electronic echo, pieces with multi-tracked wind instruments, and pieces with synthesiser backdrop over which a wind instrument (or instruments) play. So it seems rather perverse to have titled the next solo album Withholding Pattern (1985), as it continues to explore the soundscapes of the earlier album. Synths play an increasing role: four of the eight pieces feature them prominently (and one other more discreetly), so listeners who find them tinny or tinkly or fundamentally unjazzy will be uncomfortable. 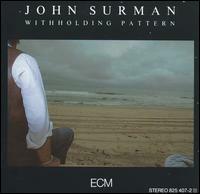 I think however that Surman's use of them, and the range of colours they offer, is often masterly. Compare for example the dystopian, threatening atmosphere they help create in 'Wildcat Blues' (listen on Youtube here), with their shimmering, dancing 6/8 patterns in the melodic 'Changes of Season', over which the soprano sax weaves its wistful, folky lines, or their mesmeric chattering in 'Holding Pattern I' (the only purely electronic track on all the albums). The solo albums wouldn't be possible without the vital contributions of synthesisers. The first piece, 'Doxology', begins with a wheezy choir of wind instruments like an aged harmonium being coaxed back to life. A plangent baritone plays a dignified, rather hymnal tune (indeed, a doxology is a type of hymn). But on 'All Cat's Whiskers and Bee's Knees' the baritone (with echo) shows its jollier, jauntier side as Surman lets his hair down. Bass clarinet is featured on 'The Snooper', a solo theme and variations on another (somewhat buried) 6/8 dance tune. 'Holding Pattern II' reuses the synth tracks from part I but elaborates them by overlaying wind instruments. It begins with treble or tenor recorder establishing an other-worldly mood before the synths enter, and then a dusky baritone solos, later joined by a pair of riffy sopranos; it gets livelier, and even dance-like, but remains stately, almost majestic. The whole composition builds beautifully and artfully through its eight plus minutes, as does the other longer piece, the lyrical 'Changes of Season'. Withholding Pattern is wonderful, and full of wonders, and a step up from Upon Reflection, good though that is. Just two years after Withholding Pattern came Private City (listen to the whole album on Youtube here). Two of the eight pieces were written for a ballet, including the opening 'Portrait of a Romantic' (presumably in some way a musical autobiography). It begins (like the last piece on the previous album) with solo recorder, until synths and a bass clarinet enter and state a courtly waltz theme in a minor key. It's gorgeously languid, introspective, and rather noble (though the bass clarinet can't help sounding a little comic). The other ballet number, the highly atmospheric 'Not Love Perhaps' (in 5/4, not the most obviously danceable time signature), is also in a minor key; the soprano sax is mournful and full of longing, and the synths sometimes doomy and ethereal. It ends with an unaccompanied cadenza for soprano (in which Surman uses circular breathing in order to play long unbroken melodies). Some of the other pieces seem more danceable, notably 'On Hubbard's Hill', a restrained rustic jig for recorder, and the delightful 'Roundelay' with its lazy rhythms and lovely soprano-led tune. (This is one of the few pieces on the solo albums to have something like a standard chord progression.) The soprano on 'Undernote', on the other hand, is bleak, distant and compelling, but on 'The Wanderer' it states the beautiful tune sweetly and, towards the end in particular, passionately. The baritone (very prominent on the earlier albums) gets only one feature, the closing 'The Wizard's Song' in which the synths build an intense and complex rhythm and the sax stokes up the fieriest music since 'Beyond a Shadow' on Upon Reflection. The overall mood of the album is a little lighter than that of the others, partly because the soprano sax (and the recorder, although it features on only two pieces) are the dominant voices, rather than the darker sounding baritone sax and bass clarinet. 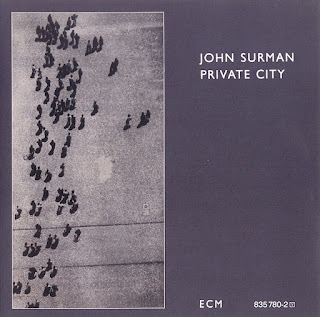 Private City is meditative and tuneful, and perhaps the most accessible of all the solo albums.